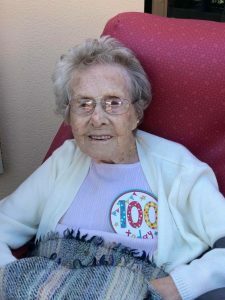 Great grandmother, Elsie Criddle, a resident of our Brocastle Manor Care Home in Bridgend, celebrated her 100th birthday recently surrounded by family, fellow residents, carers and staff at the home. Brocastle Manor staff organised the special get together which included a visit from Bridgend County Borough Mayor, John McCarthy and his wife Judy McCarthy a buffet, gifts and a birthday cake. A brilliant turnout of around 30 close family members and friends joined Elsie for a delicious afternoon tea provided by Lynda’s Cakes, Bridgend to help her celebrate the occasion. A special part of Elsie’s birthday was receiving a telegram from the Queen as well as a telegram from the Department of Work and Pensions to acknowledge the significant milestone. Mrs Elsie Criddle nee Cook left Viriamu Jones School in Gabalfa, Cardiff aged 14 and a year later she went to a local technical college to study cookery, dressmaking, hygiene & home nursing and English. Elsie was an accomplished cook and dressmaker while the nursing aspect was later put to good use in the NHS. At the age of 21 Elsie married Herbert Criddle and they had two children, Anne and John. She worked as a receptionist in the maternity department in Glossop Terrace, part of the Cardiff Royal Infirmary before transferring with the department to the newly opened University Hospital of Wales where she remained until retiring at the age of 65. Elsie loved her job, meeting many people and was well respected by staff and patients alike, some of whom she is still in contact with. Brocastle Manor Care Home provides nursing and care for 78 older persons aged 65 and over. The home also has a separate, specialist care facility for EMI (elderly mentally ill) residents. To find out more or to arrange a visit please call the home on 01656 679120.